I shot the photograph while living in India, during a stay in Kolkata in 2009. In it's state of being frozen in time on the one hand, or you could as well say constant decline, life in the city is bursting with vitality on the other hand. 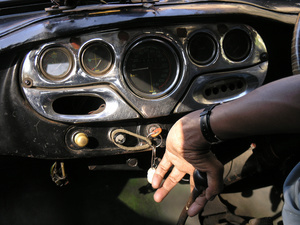 The photograph reflects both, the antique but functioning cab driven by the hand of a driver alway ready to push ahead.